Congratulations on your purchase of your brand-new tadpole. Yes we have some very simple instructions on setting up your habitat so that your animal can grow into healthy frog. 1. When receiving your live tadpoles immediately pour the contents of the bag into a medium to large cup. There should be plenty of room for the tadpoles to be swimming around in the totally submerged. 2. THIS IS A REQUIREMENT there to so will result in death of all animals. Add your frog, tadpole water conditioning powder to a separate container full of water. 1 teaspoon per 10 gallons of water. This is Vital do not skip this or you will have a catastrophe on your hands. Make sure the temperature of the water is approximately room temperature to make sure that your tadpoles do not get shocked from the change in pH and temperature. 3. Have a final container that you're going to use as your tadpole and frog habitat. This could be a plant frog kit by uncle Milton, a large fish tank or aquarium, or even a large plastic container so that your tadpoles can swim around happily. What your large cup of water and transfer that water into the final home for your animal. You can continue doing the drip technique or slowly add one cup or 20 minutes or so for small body of water to habitat. 3. If you some airline tubing from an aquarium or other small typos we can do one or two drops a second that is the ideal amount of water change. 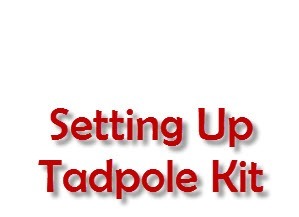 You can tie a knot into tubing and start a siphon from the new water into the container that has your tadpoles. This should be a gradual thing that happens over approximate hour or more. The longer happens the less chance of shock . We offer high quality tadpole food that includes many nutrientsas well asspirulina algae.